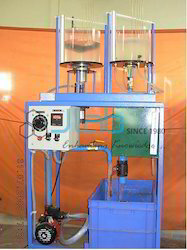 - Cylindrical vessel 300 mm D.I.A with central bottom outlet, mounted over rotating platform. D. C. motor with controller to rotate the vessel. - Measuring tank - 400 x 300 x 400 mm mounted over the sump tank. 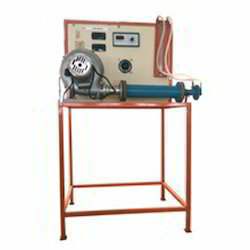 - Centrifugal pump to circulate the water. - X-Y Co-ordinate measurement probe. Forced Vortex Flow is an example of rotational flow and can be generated by rotating a cylinder containing a fluid about its axis or by rotating a paddle in a large volume of fluid. Under steady conditions, each particle will move with the same angular velocity and there will not be any relative motion between fluid particles. Free vortex by using a transparent vessel having orifice at the bottom and constant head water supply and depth gauge. This can be measured by depth gauge. But this is only visual demonstration by using light. Measurement is difficult as the flow motion cannot be controlled.